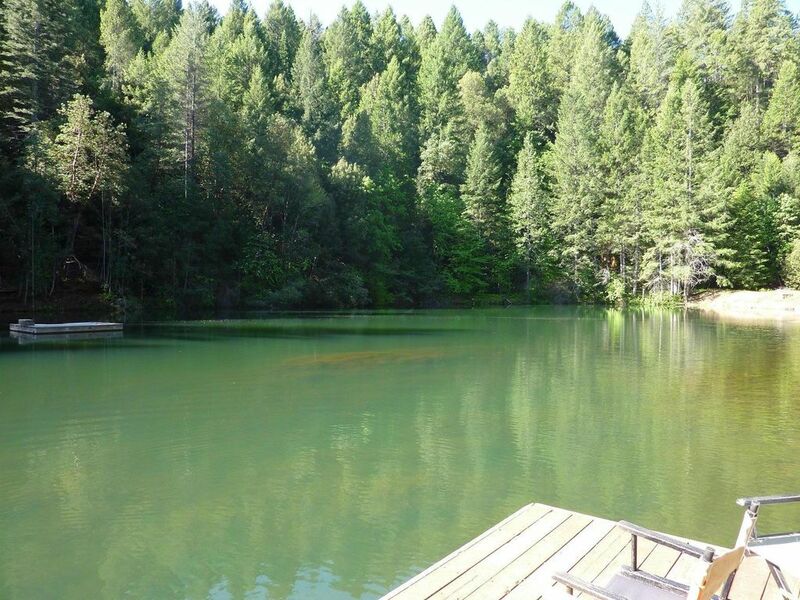 Hillside Creek Cottage is nestled in the heart of Eldorado County. Our place has that cabin feel with all wood ceilings with a beautiful large fireplace in the living room and master suite loft upstairs. It also has all the upgrades, amenities and conveniences of being at home. Our home is 100 yards from a community lake with a dock where you can fish, swim or just lay out and relax. Enjoy all the beautiful trees that surround the lake. This is the perfect place to bring family and friends or just a getaway by yourself. The cabin sleeps 10, so don't worry about the room. We sit at an elevation of 3500 feet so its the perfect place year round to enjoy winter, spring summer or fall!! We bought this property, just to get away from it all, and also being close to the lake is always a plus. (probably about 100 yards from house). toilet, Located in bedroom on the right. Surrounded by forest and lake. Small country town about 10 minutes away. Just up the trail beautiful private lake!!! Walk 100 Yards and enjoy this beautiful private lake!!! Enjoy the sounds of the creeks right off the back of your deck!!! Large fireplace with plenty of wood stacked outside. Also has counter with two stools. Multiple books located in living room and also bookcase in downstairs bedroom to the right. Located in dining room in cabinet. Childrens toys in first bedroom to the right and also bookcase in living room and some upstairs in loft. The cabin was lovely & peaceful. It was large enough to accommodate us all, yet with a cozy feel. The short walk to the lake was beautiful. The town is charming. Great place to stay, relax and enjoy nature! We had a great time staying here. PG&E did turn off the power due to wind, but we just wandered around and looked at property. Nice area,nice restaurants and a good place to get away. My fiance, now husband, and I had the privilege of staying in cottage. It was incredible as are all of the cottages. It is very up-to-date and very clean. The owners are extremely welcoming and we enjoyed our conversations with them. This is a definite must to go back to. It is a perfect, fairytale place! We stayed at Hillside cottage for Nature. The cottage was comfortable, clean, with great views- it was perfect! We would sit outside in the morning & evenings to take in the views before we began our day of exploring the area. Nice place friendly check in. Different filling than other usual same cottages. Owner manage well and provide good services. I recommend this to try. Perfect escape - we're still talking about it! I stayed at the Hillside cottage for 2 nights and had a wonderful time! Our stay was quiet, peaceful, and relaxing. Spent our time looking at the beautiful mountain views during the day and the incredible stars at night. Will absolutely visit again! Make sure you check out the fishing not only at your private lake but at the reservoir just up the road. Also make sure you go downtown and check out the unique restaurants and history of this town in Gold Country. Don't forgot to relax next to your lake with your feet in the water taking in all your beautiful surroundings!